For me, Christmas is always very low key, with movies and Chinese food the big highlights. This year, I still made it to the movies but instead of Chinese, I had Italian. There were a lot more restaurants open on Christmas in Boca than there were in New Jersey, so my Bubby and I had more of a choice when it came to deciding on our dinner spot. The movies were packed! We saw The Girl with the Dragon Tattoo and absolutely loved it! Rooney Mara was exactly what I pictured Lisbeth Salandar to be like when I read the books. I highly recommend seeing this movie, whether you’ve read the series or not. Anyway, we had dinner at Renzo’s of Boca. We were able to sit outside, which was really nice. It was a gorgeous night and the weather was perfect for outdoor dining. We were starving, so we didn’t hesitate on our wine order and asking for the bread basket right away. They brought bruschetta along with the bread, which was a deliciously seasoned garlic loaf. Bruschetta is one of my favorite appetizers because it’s so light and fresh and won’t fill you up before your meal. I ordered the calamari and shrimp. It came in their homemade tomato sauce. This sauce is so good! It’s so popular it can be bought at Publix. It’s full of huge chunks of tomato and it wasn’t too heavy at all. I may have to get myself a can of it soon… Bubby got the Chicken Scarpariello, a chicken dish with mushrooms and sauce tossed in garlic and balsamic vinegar. We shared a piece of the ricotta cheesecake for dessert. This was very different than your standard piece of cheesecake. The ricotta cheese makes it so much lighter and it’s a lot less sweet. I liked it enough to eat it, but I don’t think I would order it again. 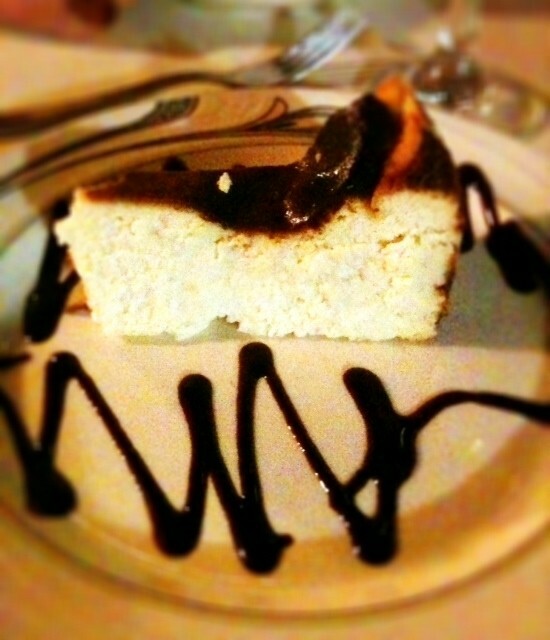 I love cheesecake for its rich, creamy texture and especially for its sweetness. This just didn’t cut it for me. Overall, we enjoyed our Christmas dinner together and had a really nice time. Another celebration dinner was called for when one of my good friends from New Jersey was in town visiting with her boyfriend. Before they headed down to the Keys they stopped in Pompano Beach to visit family and spent the day with them. Leanne’s uncle owns a restaurant right in Pompano called Calypso, so the three of us, along with her boyfriend’s parents, went there for dinner. What a great little place… It was really busy too; it seems like a very popular spot in the area. The Caribbean-style food was so good. Lots of fresh fish options are available with a variety of cooking preparations such as Jamaican Jerk and Curry. 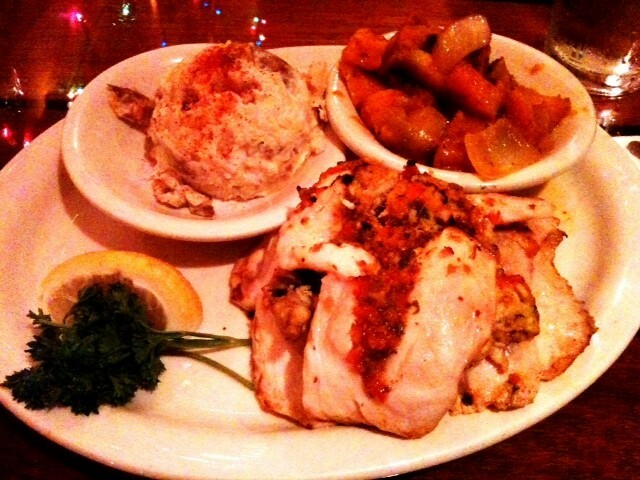 I got the dolphin stuffed with a seafood and vegetable filling, the homemade potato salad and their fresh vegetable of the day, which was a roasted acorn squash that was out of this world. The potato salad was addicting! I normally don’t eat potato salad unless it’s made with barely any mayo or with something else entirely, but this side dish was seasoned so well that I could barely taste anything else aside from the potato and the spices. I really loved every part of my meal. There were so many other choices on the menu that I wanted to try, so I will definitely be going back soon. The last restaurant I went to before the end of 2011 was Villagio’s in Mizner Park. This was a very special dinner, celebrating my new job. It’s funny that I went to two Italian restaurants so close together; I don’t normally eat Italian that often. Just as with Renzo’s, we were given bruschetta with our bread basket. In comparing the bread and bruschetta to Renzo’s, I’d give the bread to Renzo’s and the bruschetta to Villagio. We started with an appetizer to split, an eggplant mozzarella dish that was really good. For dinner we split the Chilean sea bass special served in a lemon butter sauce topped with shrimp, grilled peppers, and capers, along with a side of pasta and sautéed spinach. That spinach was seriously cooked to absolute perfection. I haven’t tasted spinach that good in awhile. It was the perfect complement to the light, airy sea bass and my pasta which I completely covered in parmesan cheese. Dessert was the best part of this meal. At first we weren’t even going to order anything, but then Bubby noticed they had gelato tartufo, which is gelato coated in a hard chocolate shell, so we got an order of that — coffee flavored. Inside the coffee gelato were frozen berries, and it was topped with a yummy whipped cream. This was some celebration dinner, that’s for sure. Even though I will be starting a full-time job next week, I promise that I will continue to take a bite out of Boca and provide you with all the details! My foodie resolutions will not go out the window just because I’m back to being a working girl, I promise!